Last Wednesday I took my first long solo trip on the Magic Carpet. By solo I mean just me on the motorcycle and not just one motorcycle. I’ve grown very accustomed to having Donna sitting behind me and having her to talk with. I just enjoy having her back there and it’s not just for the neck and shoulder rubs on long trips (although those are a big plus). Our young beagle had very recently had spinal surgery and Donna needed to stay at home with her as she can’t be put in a kennel yet, even though she is healing ahead of schedule. I headed down from metropolitan Atlanta, Georgia to the Daytona Beach, Florida area. My Mom is a breast cancer survivor and has now acquired another malady that puts her in yet another fight. Mom & Dad needed some help with a few things. Mom’s just not up to getting out and doing things like cleaning gutters and patio furniture with Dad right now. This is a 480 mile door to door trip and would be all interstate this time. I had planned to leave at about 6:00 am so that I could be well ahead of rush hour traffic on the interstate. Well plans don’t always work out and I wasn’t rolling until just before 7:00 am. Yes, I got up on time. I kissed Donna goodbye and was rolling. I wasn’t on Interstate 75 very long before I was greeted with brake lights in front of me. The traffic was brutal. It made me happy that I’m retired and no longer have to make that trip everyday at that time. The traffic added at least another hour to my trip. My travel time was over 10 hours to get to Florida! The weather wasn’t bad either, being cloudy or overcast most of the way. Coming home the following Tuesday was just the opposite. It was the same route but I got on the road at 6:00 am this time after saying goodbye to Mom & Dad. The sun began to rise from the Atlantic Ocean over my right shoulder as I rode north. Temperatures were even the same as the trip down. Both times I started out with temperatures in the low 60’s (F) and they rose to the mid 70’s (F) for my destination. Only for the return trip I had blue, cloudless skies. This time I made the trip in 7 hours and 16 minutes of driving (moving time) according to the GPS. I arrived home 9 hours and 10 minutes after I left. That time included two meal stops and 3 gas stops. I was pretty impressed that I made it from Daytona Beach to Valdosta, GA on a tank of gas and still had just over 50 miles left according the K1200LT’s trip computer. This was my first long trip using my earplugs which made a world of difference. The earplugs had a lot to do with the lack of fatigue from the sound. A quite noticeable difference. Wearing the ear plugs for that long (other than meal stops) caused me no physical discomfort. I also paired the Scala Rider Teamset Pro with my Windows Phone instead of the GPS this time. As I approached my parent’s home while I was traveling on I-95 I was able to call them with an updated ETA. They had no idea that I was actually calling from the motorcycle and said it just sounded like I was outside. I know the nemesis of motorcyclists is text messaging drivers. But on the way home, a friend and Donna both sent me a few, that the phone read to me and I replied by voice commands and speaking he message coincidentally while either pumping gas or preparing to leave from lunch (so I guess I wasn’t texting and riding after all). I really wasn’t too happy with the volume of the messages and the few phone calls until I remembered that I had to raise the volume on the phone and not on the intercom! Would I leave the phone paired to the Scala? No. I’d just assume leave it paired to the GPS. But this was a special trip and I didn’t need the GPS for directions and just used it for arrival time purposes. My new Windows Phone doesn’t have all the features my last Windows Phone did. In testing it, the old phone would voice announce the caller by name and use the phone’s ringer or the caller’s unique ring if they had one. It would also announce who the text message was from so you could “listen or ignore”. The new phone just uses a generic phone ringer with no voice announce and merely informs you of “new text message” and asks if you want to listen now or later. I liked the features on the old phone better. But since I don’t plan on using except for an interstate trip like this one, it doesn’t really bug me. I’d rather have the GPS directions sent to the Scala. The Scala Rider Teamset Pro allow only one additional Bluetooth connection to each headset in addition to the one already taken by the intercom. 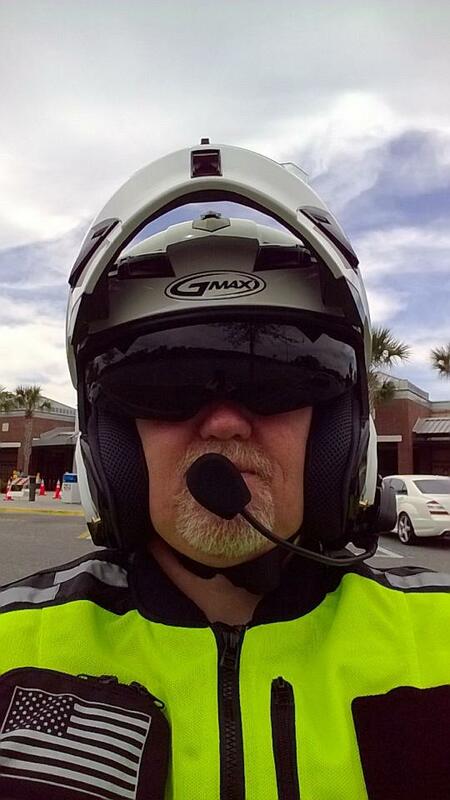 When leaving Florida in the dark, a motorist pulled up next to me and told me “You know the back of your helmet is flashing?” I told him it was to make me more visible, especially in low light conditions. He laughed and said “Well I guess it works then!” Our helmets have a red LED light in the rear that can be set to off, steady on, slow flash or fast flash. He was right, I guess it works. My Dad had also run down the driveway calling at me to tell me my helmet was “blinking”. Florida Welcome Center. The clouds behind me look like mountains. Well since Christmas I’ve been riding with earplugs. I guess I want to preserve the hearing I have left along with reducing the effects of my tinnitus. Actually, I’ve been using two different kinds of re-usable plugs, Etymotic ER20 and E.A.R. Do It Yourself Custom Molded Ear Plug. I’m now thinking that I like the Etymotic plugs better. They really muffle wind noise around the helmet and do just as they advertise and let “gas station” conversation be heard. They are comfortable (at least for me) to wear. I found no real need to raise the volume on my in-helmet intercom and the helmet doesn’t affect them. I do like the E.A.R. plugs too and my problem may simply be the way I made them. You need to knead two compounds together, then mold them into your ear and let it set up for about 10 minutes. I think I may have kneaded until it started to harden too much before placing it in my ear. The second ear went much smoother than the first one did. Because they are custom molded they are really comfortable. They also actually do supply more material than you’d need. The optional screw-in neck cord is a big plus too. Wind noise around the helmet seems louder with the E.A.R. plugs though and more bothersome. Off motorcycle conversation is muffled quite a bit and I did need to raise the volume of the intercom too. I’m keeping both sets handy but will probably use the Etymotic ones the most. I did get the E.A.R. plugs at Earplug Superstore (I happened to use their links for both plugs as they sell both) and got the Etymotics from Aerostich. Today was my monthly Blue Knights lunch and meeting. This month it was held at Poole’s Real Pit BBQ in Ellijay, Georgia. Our Chapter Officers hatched an idea to have 2 different groups ride to Jasper, GA where we met and then ride on up to the restaurant in Ellijay. The forecast was decidedly chilly, being in the mid 30’s for the ride up. Three of us rode up from Woodstock to Jasper where we met eight more motorcycles and members. We met a few members at the restaurant who went ahead and rode up in their cars. The plan was that after the meeting our Vice President would lead a ride across Fort Mountain from Ellijay to Chatsworth and then on south towards most of our homes. We thought we had a total of three members who decided to go on the ride and then it dwindled down to just two of us. As we were preparing to leave, I asked “Were those snowflakes?” Sure enough they were. A slight chance of snow flurries was in the forecast had come true. Sean and I headed across the mountain where the temperature did drop to 31 degrees for a while as we rode through more snow flurries. Nothing stuck to the ground, the motorcycles or us and the road never got wet. It was fun seeing the snow while riding though and Sean and I had fun, both making it back home by mid afternoon. One thing I tried out on this ride was using my Window Phone with the Scala Rider Teamset Pro. I previously had an older Windows Mobile phone that I used easily with it to make and receive short calls by voice. But my Windows Phone 7.5 has the ability to read me text messages via Bluetooth and even let me reply. So, I sent Donna a text message before we left. She replied and when the intercom gave me the choice to “ignore or read” I said “read” and it read me the message. I then said the “reply” option and spoke my reply and told it to send it. I’m not sure if I’d use this a lot but it’s nice to know that I can when I don’t have the Scala Rider paired with the GPS. The video below is of members leaving the restaurant after our meeting. Today’s temperature hovered around 70 degrees here in north Georgia which is pretty unusual. You see, contrary to popular belief, we do have winter here and in the area we rode in today, snow is not unusual. I missed out on a ride yesterday with my Blue Knights Chapter but Donna and I made up for it today. It was cloudy and overcast but quite a pleasant day. Temperatures were in the upper 60’s when we left very late in the morning and even peaked at 72 on the way home. We had no particular route planned, but figured we’d head up to Turner’s Corner Café for lunch and then go from there. But even our lunch destination wasn’t set in stone as it was just us riding today. We headed on up through Dawsonville and Dahlonega, passing Rider’s Hill along the way. Rider’s Hill looked to have a parking lot full of motorcycles today. After passing Rider’s Hill a large group of sport bikes came towards us and they looked pretty good, riding in a very tight, staggered formation. We did stop at Turner’s Corner Café for a nice leisurely lunch. From our table inside we could see the stop sign for Georgia HWY 9 and US Highway 129. We watched solo riders and groups of motorcycles pull up and make the left turn heading up Blood Mountain. One group was a trio of women, all on BMW motorcycles; two R1200GS models and an R1200R Roadster. I noticed the motorcycles and then that they were all women! If you continue on US 129 from there on into North Carolina, the highway eventually becomes the infamous “Tail Of The Dragon”. After lunch we headed down to Cleveland to Dahlonenga and from Dahlonega headed for home the same way we had come up. In winter you can see a lot of things along the road that aren’t visible the rest of the year, being covered by kudzu or other foliage. I made a note to myself to come along this route again soon to take some pictures of those roadside anomalies. It was really good to get out for some “throttle therapy” and exercise both us and the Magic Carpet. I also got to use 2 of my Christmas presents on today’s ride too! One was my pair of Sliders Kevlar Cargo Motorcycle Pants. The pants are khaki colored cargo pants, looking pretty much like any pair of pants. But, underneath in certain areas they are lined with Kevlar for abrasion resistance and have CE approved armor in the knees. Donna said they looked pretty good, not looking like my bulky Tourmaster pants or other pants I’ve looked at. I’ve got to say that were very comfortable both on and off the bike too. The armor did seem to move to the inside of my knees when riding though. These would not be pants you’d want to wear in the rain though unless you had rain gear to put over them. For rain or just outright stopping wind though, the Tourmaster’s or something similar is still the way to go though. The other item was my ETYMOYIC earplugs. I’ve been debating on earplugs for quite some time now, especially to help out with some of the wind noise around my helmet. When we switched to the new helmets, they helped dramatically with the noise but wind around the helmet was still there, even behind a fairing and a windshield. They work great! Just as they advertised, they reduced the noise but because of there design, still allowed for normal conversation and intercom use. I did raise the volume on the Scala Rider Teamset Pro to hear Donna better (as expected). Wind noise was still there, but muffled and not as bothersome when at highway speeds. I found that I heard more of the K1200LT’s engine along with environmental sounds around me. I didn’t think that they could make that much of a difference. Lunch at Turner’s Corner Café. Notice the “Bikers Welcome” sign on the post? The New Helmets Are Here! The New Helmets Are Here! Last week our new helmets arrived. We ordered 2 GMAX GM54 modular helmets in pearl white from Competition Accessories in Rock Hill, SC. Since last week, we’ve used the helmets for over 500 miles already and have managed to use them in heat, cool and even rain. A modular helmet looks like a standard full face helmet but the “chin bar” portion can raise to make it an open face helmet so that you can talk to people while stopped or drink something. The helmets also have an internal sun shield which was one of our requirements when helmet shopping. So far we can say that they are excellent helmets but we hope to never need them for their true intended purpose. We installed our Scala Rider Teamset Pro intercom to the helmets in a matter of minutes. The helmet is noticeably heavier than our old open face helmets. But take into account that there is more to helmet, that makes sense. But the helmet does not feel heavier when worn and hasn’t caused any neck soreness. For some reason I can move my head from left to right much easier. With vents open the ventilation is very good but not noisy. The CoolMax liner does just what it’s supposed to do, wick sweat away. I love the internal sun shield! It great to put it down when needed and retract it when not needed. While the helmet does not seem a lot quieter than the open face helmet with a face shield the noise is different. It more of wind noise and not a roar. The old roar could bug my ears sometimes while the quieter wind noise does not. The intercom is much crisper and easier to hear. That’s probably because the mic is now in the helmet along with the helmet being quieter. You can raise and lower the clear shield easily. You can raise the chin bar easily. The red LED light on the rear is a nice safety feature. Peripheral and up & down vision is very good. The entire internal padding system is removable for washing. The pins and latch for the flip-up chin bar are metal. The vents are easy to open and close. Sometimes it can be difficult to lower and lock the chin bar. But that could be me getting used to it. Both times while riding in the rain I got a solitude streak of water on the inside of the face shield when it was closed. It wasn’t constant, it just went down once and didn’t return. When the vents are open I get a whistle when turning my head extremely left or right as if looking over my shoulder. It does not whistle with the vents closed and the windshield position can affect the whistle. Donna does not get the whistle. After 5 or 6 hours of wearing it I get a “hot spot” on the top of my head. I can alleviate it though by moving the helmet slightly forward or back on my head or even raising the chin bar for a few minutes (yes I know, I shouldn’t do that). Donna’s comments are below the video. In the video the LED light appears to flash in the steady “on” mode. This is not the case when looking at it with your eyes. Donna’s positive comments are nearly identical to mine so there’s no use in repeating them. Donna says the helmet is quieter than the old open face helmet with a face shield. Donna gets the same trickle of water if it’s raining. Donna says she can have difficulty opening the chin bar along with opening and closing the vents. She does though attribute it to learning how to use the helmet and says it’s getting easier. Remember, we are wearing these helmets on a motorcycle with a full, frame mounted fairing and an adjustable windshield. In June we bought a Scala Rider Teamset Pro Bluetooth intercom and only had the opportunity to use it once before the bike was down with the need to replace the rear tire. We purchased the Scala Rider Teamset Pro which is a wireless bluetooth rider to passenger intercom set. This unit is for communication between the rider and passenger only and will not communicate with other motorcycles. It will pair with itself along with a separate cell phone for rider and passenger. You can conference the rider or passenger into your conversation using the intercom but I would hope that most of us don’t talk on the phone and ride. You can also pair a bluetooth GPS unit, and MP3 player. There are also wired connections for Mp3 players. I was told a warning about the wireless MP3 that is in your phone in that the intercom will see it as an incoming call and override any intercom conversation. I haven’t had the opportunity to use a GPS unit with it yet but hope to soon. My cellphone paired with it with no problem and while in the house and yard I was able to make and receive phone calls but riding around I couldn’t get it to make a call for some reason. I’m not concerned enough to find out why I can’t make phone calls as it’s not that important to me. UPDATE: I figured out that I was pushing the wrong button on the headset! This unit is voice activated as most intercoms are but it is also dependent on ambient noise to operate. If you try it out in a quiet room it won’t work. Ride the bike or go outside where there’s traffic and it will work. The intercom also changes volume based upon noise. In other words, the faster you go the louder your intercom will be and then readjust as you slow down. There are also volume buttons to fine tune it to your liking. 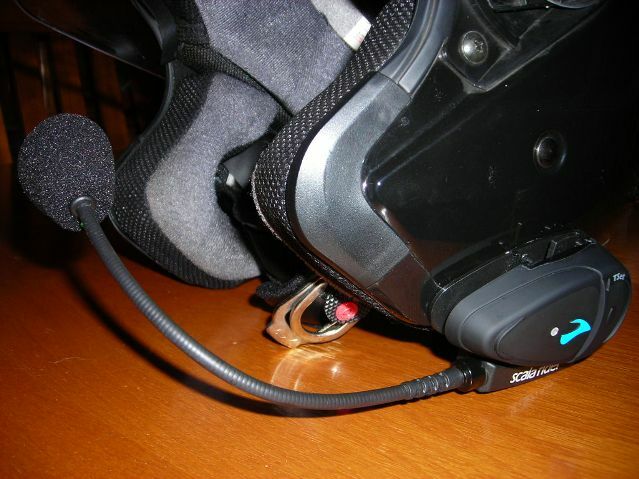 The intercom mounts attach to each helmet and the intercom is removable from the mount. The speakers mount in your helmet with provided velcro or in your helmet’s speaker pockets if it has them. We rode for about 4 hours today and intentionally left the units on while we stopped for lunch and had no problem with power and the units are rated for twice that long anyway. All in all I was very satisfied with them. Conversation between Donna and I was clear and understandable. Mic placement however was more critical with the Scala Rider than it was with the wired headsets used with the BMW intercom. When the unit doesn’t detect speaking for about a minute it automatically goes back into standby mode. When the driver initiates a conversation, you know the VOX is activated by a tone in the speakers, but the passenger does not hear the tone. When the VOX goes into standby the driver will get a higher pitched series of beeps to let you know of standby mode and again the passenger does not hear it. If the passenger initiates the conversation the passenger and not the driver hears the beeps and tones. You can manually put initiate VOX or go to standby by pressing a button on the unit mounted on each helmet. It was nice not having connected from you to the motorcycle. We also liked the feature that at a gas stop Donna could walk around and we could converse while still wearing helmets as long as she stayed with bluetooth range. With the Scala Rider Teamset Pro you don’t hear your own voice in the helmet speakers like we did with the BMW intercom. Because of that, you may tend to speak a bit louder than needed. Donna kept telling me to just speak in a normal voice and it sounded much better. We use the unit on 3/4 helmets with flip up face shields. I would definitely recommend this product to a friend looking for an intercom. Well it’s time for a new intercom in the K1200LT. Over time there’s been a pinched wire or two that’s caused a loose connection or a short. I have to jiggle my headset plug or position it just right where it connects to the motorcycle to get both speakers to work. At times I get a “crackling” in my speakers. I’ve actually tracked down the short for me and positioning the air intake winglets can affect the performance. I can get a new part but it also means stripping down the front end of the bike to replace. On the other hand, Donna goes through a lower headset cord a year just from wear and tear at the flex point on the cord where it plugs into the motorcycle. The cords are only about $23 but you get tired of buying them! So I’ve been shopping around and yesterday we bought a Cardo Scala Rider TeamSet Pro. It’s a wireless BlueTooth system between the rider and the passenger. It’s got the ability to add a cell phone to each headset (not sure if we’ll do that), a BlueTooth enable or wired MP3 player and a BlueTooth enabled GPS for audio directions. Last night I installed the headsets in the helmets and charged both the units. Hopefully later today we’ll take them for a test run. The instructions actually advise against testing them inside in a quiet environment because the system is dependent on ambient noise to operate. Once we have a decent ride with them I’ll post a review of the system.